Riders will start the zip tour, featuring 4 zip lines, by trekking up 115 feet of stairs INSIDE the Labatt Blue six-pack. I mean, you need to get that workout in before you drink a few beers at the bar, right? After arriving at the top of the stairs (it’s not that bad, promise), you’ll be on your way! 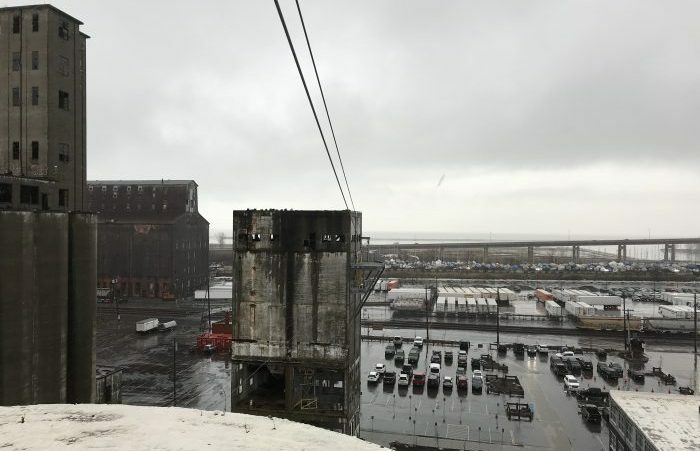 Local adventurers can take in views of the silo ruins from the sky and make their way across an Indiana Jones-style rope bridge before reaching the last stop that will land them right at the Riverfront Patio. #blessed Although the course is technically open, be sure to give them a call first because they always want to make sure weather conditions are safe for riders. With the Motoped Bikes, Tiki Tours, Silo Vertical Tours, water toy rentals, rock climbing, the pedal boat, curling, and now the zip line, RiverWorks is quickly creating an adventure haven for locals to get their adrenaline fix! The Riverworks Zipline Course currently has very limited availability. If you’re crazy enough to face the challenge in these frigged temps #YOLO, just call (716) 342-2292 or shoot Matt Prime an email at mprime@buffaloriverworks.com first to reserve your ride time on Saturdays and Sundays. As of right now, it is strictly reservation only and the course is only open if it’s at least 32 degrees out and the wind cooperates. They have to make sure it’s safe for everyone, but that’s still pretty chilly! Riverworks is anticipating another busy summer with the addition of their newest exciting adventure. Keep them coming!